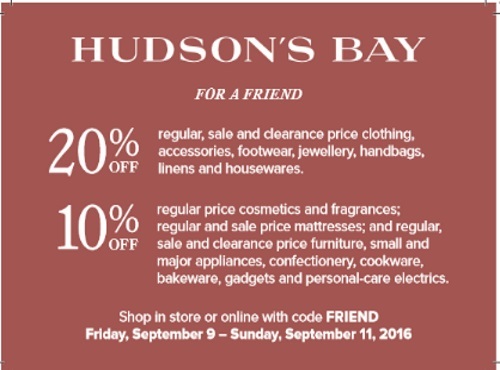 Hudson's Bay has a VIP Weekend Offer this weekend that we can share with our friends, meaning all of you! Save up to 20% off with the promo code below! Save 10% off regular price cosmetics and fragrances, regular and sale priced mattresses, and regular, sale and clearance priced furniture, small and major appliances, confectionery, cookware, bakeware, gadgets and personal-care electrics. Enter the promo code FRIEND at checkout. Offer is valid until Sunday, September 11, 2016.